An alliance of health groups, formed to raise the profile of climate change effects on broader community well-being, has backed calls for recommendations on the long-term water needs of the Murray–Darling Basin to be heeded. 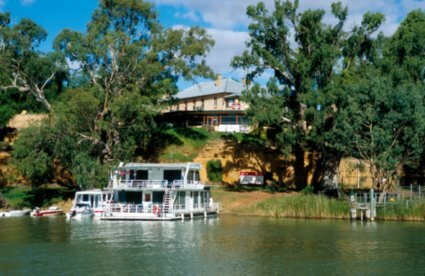 Leisure craft and houseboats moored at Swan Reach on the Murray River, South Australia. The Climate and Health Alliance (CAHA), a coalition of more than twenty established rural and metropolitan organisations from across the country, recently joined ‘Voices for the Murray–Darling’, an initiative of concerned Basin and metropolitan groups and community members calling for the restoration of environmental flows recommended by scientific assessments. The Guide to the Basin Plan, which sets out science-based recommendations on water allocation for the Murray–Darling region, was released by the Murray–Darling Basin Authority for public consultation last October. In December, in an unprecedented published statement1, 58 prominent environmental scientists endorsed the general assessments of the plan and urged that a way be found to prioritise the long-term considerations of environmental, community and economic impacts over immediate short-term concerns which have recently ignited. In Canberra to help raise the issue of community impacts in the Basin, CAHA Convenor, Fiona Armstrong, said the current debate around water in the Murray–Darling has failed to consider the human health implications of a failing river system, which not only has serious effects on the health and wellbeing of people who live in communities in the basin, but that ‘it affects us all, as the entire nation relies on the basin as a food bowl’. ‘The alliance is seeking the return of at least 4000 gigalitres per year to the basin in environmental flows, a volume cited by Australia’s leading environmental scientists as the minimum required to restore river ecosystem health,’ Ms Armstrong said. ‘We want to see communities assisted to adapt to sustainable water use, and a process undertaken to support the establishment of secure economic futures for affected communities. Meanwhile, CSIRO has been asked by the Murray–Darling Authority to lead a review of the methods used in the plan to determine the sustainable level of water diversion in the Basin. The plan drew on national and international peer-reviewed research in its recommendations.